Last week, Lexus announced it would be unveiling a mystery new model at the 2019 Shanghai Auto Show. While the teaser wasn’t very revealing and only showed the model’s front fascia, reports claimed we were looking at a new Lexus minivan. A second teaser has now been released by the automaker showing the profile, and there’s now no doubt Lexus is teasing its first-ever luxury minivan. Lexus has also confirmed the new minivan will be called the LM, just as the company’s recent trademark filings suggested. Lexus also trademarked the LM 300h moniker, so there will also probably be a hybrid variant. As expected, the Lexus minivan appears to be based on the Toyota Alphard as the profile looks identical, with sliding doors and long rear windows. 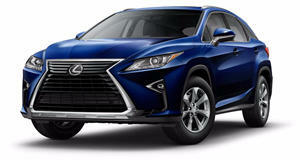 The previous teaser showed the Lexus minivan’s front fascia will resemble the RX crossover with a revised grille and slightly different headlights. Available in selected Asian markets, the Toyota Alphard is available with a 3.5-liter V6 engine producing 296 horsepower and 266 lb-ft of torque sent to the wheels through an eight-speed automatic transmission. Don’t be surprised if this powerplant is used in the Lexus LM minivan, as the automaker filed a trademark for the LM 350 nameplate. The Lexus LM minivan will reportedly enter production next year at Toyota’s Inabe factory in Japan, where the Toyota Alphard, Vellfire and Hiace are also assembled. Don’t get your hopes up for the Lexus LM to go on sale in the US, however. Lexus is more likely to sell it exclusively in Asian markets where minivans are still extremely popular. This is in stark contrast to the US, as demand for minivans is falling thanks to the unrelenting appetite for SUVs and crossovers. We’ll find out about the model’s availability when the Lexus LM debuts on April 16 at the Auto Shanghai 2019 in China.